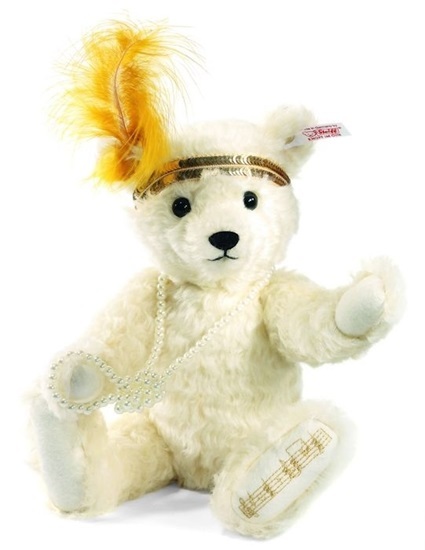 Steiff celebrated the 90th anniversary of the Charleston by creating this bear...aptly named the Charleston Teddy Bear. Patterned after the "Flapper" era, she has yellow feathers tucked in a gold sequin headband. She's made of wavy white mohair with musical notes embroidered on her left foot, and of course no decent 20's flapper would be without a long pearl necklace knotted at the bottom! She is musical with a wind up key in her back that when prompted will play the original Charleston song. She is a North American Limited Edition. Charleston Teddy Bear is 5-way jointed and approximately 12 inches long. She was lovingly made in Germany.